March is coming to a close, and I have some exciting things lined up for all of you in April. :) But first let's take a look back at the instagram pics that didn't make it over to the blog over the past month... There's some never-before-seen manicures, some shopping pics and one behind the scenes shot of my lightbox setup. Check them out below, and then leave me your IG username in the comments so I can check you out in return! Some fun shots from instagram! I don't know why I adore "behind the scenes" type of photos so much! I wish my camera would connect to my electronics over wifi! 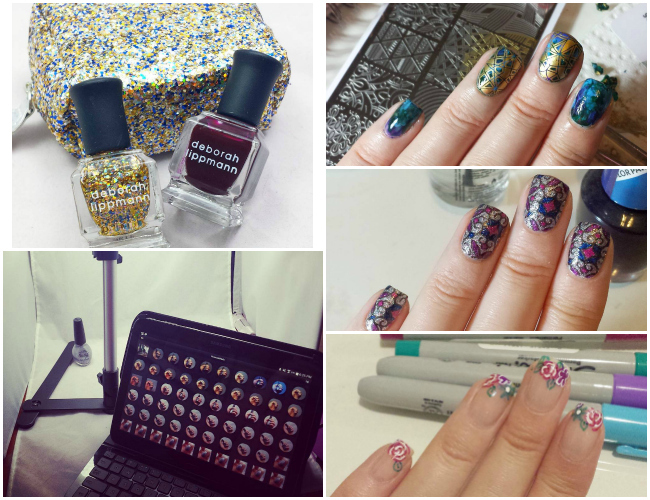 So much nail art goodness here! And yay to a new tech breakthrough! All of these are beautiful designs! Ohh I love all of these! Love the idea of this style of post! Thanks for sharing those IG shots! this is wonderful! What a clever idea to collect your IG shots together.